The information and photos on this page are from many sources. We have done a lot of research ourselves, especially searching through old newpapers and BDM records and visiting places of interest in Scotland, New Zealand and Australia. The assistance of other family-history-minded members of the extended family has been invaluable, including Roger Murray, the late Arthur Murray, John Seaton,John and Anthony Beale. Please contact me if you have additions, corrections or questions. I would particularly like to hear from you if you are related to our branch of the Murray family. William Murray, tailor, and Unia McLean were married on 27 November 1807 by John McKenzie minister of New Gaelic Chapel, Glasgow. The fact that they were married in the New Gaelic Chapel suggests that at least one them was Gaelic-speaking and came from the Highlands. Murray is a name from the Perthshire Highlands. In the baptismal record of four of the children, including William, the father's occupation was "Taylor". At the time of Charles' birth, he was apparently performing his service in the reserves, as he was listed as "Soldier in the Lanarkshire Militia". The witnesses varied, but it is interesting to note that a George Murray was a witness for Christian and Hugh, and a Charles Murray was a witness for Hugh. Perhaps they were relatives. An Angus Ross was a witness for two of the births, those of Christian and William. William served an apprenticeship to become a tailor (it can probably be assumed that he was apprenticed to his father) and attended the Highland Society School, a charity trades school for those whose parents had come to Glasgow from the Highlands. It was largely funded by the proceeds of the Black Bull Tavern. My great-great-grandmother, Elizabeth McEwan (1822-1864), was born in Crieff, Perthshire, Scotland and was baptised on 16 March 1822 (birth date not recorded). Her parents were David McEwan and Catharine McLaren. recorded at her death may in error, especially given the circumstances (see later). Family records state she was born in Crieff, near Perth. On 17 September 1839, William Murray and Elizabeth McEwan were married in Glasgow. Assuming the above birth information is correct, they were 19 and 17 years old respectively. 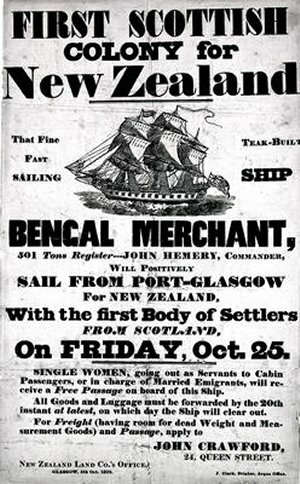 Six weeks later, they were passengers on the Bengal Merchant, leaving Scotland to migrate to New Zealand. Their ages as stated on the shipping list were 21 and 19. There is a family story that they eloped and were married on the ship, but there is a reference to only one marriage on the ship, and that was of a different couple. Perhaps the story is based on their being under age and possibly marrying without parental permission; maybe they did not reveal their intent to sail to New Zealand together. In 1839 there was a meeting in Glasgow sponsored by the Duke of Hamilton, the Duke of Argyll and the Lord Provost of Glasgow to encourage colonisation schemes to New Zealand. The New Zealand Company was essentially active in the South and the West of England and all the other ships in this venture sailed from either London or Plymouth. However, they had an agent, Mr Crawford, in Glasgow and one ship, the Bengal Merchant, went from Scotland. The 500 ton Bengal Merchant, commanded and owned by Captain John Hemery (age 29), was commissioned by the New Zealand Land Company to take Scots emigrants to the new settlement. Dr F. Logan was the surgeon superintendent and naturalist; the Rev John Macfarlane was the minister to the colonists; Mr Alexander Marjoribank was the historian of the voyage. The departure of this ship was viewed in Scotland as an historical occasion; shortly before she left, the Lord Provost of Glasgow, with a large party, went on board and addressed the passengers. They sailed from Greenock on 30 October 1839. Marjoribanks' journal records that there were 150 passengers, including 33 children. During the voyage, there was one marriage (a settler and his dairymaid), one birth and one death (a boy from sunstroke). There was dancing occasionally during the early part of the voyage, and Rev MacFarlane gave prayers every night in the cabin, while the steerage passengers gave prayers among themselves. Every Sunday when the weather permitted, divine service was performed upon deck to the whole passengers and crew. With the exception of a gale when off the Bay of Biscay, the weather was pleasant. For 2-3 weeks when crossing the equator, it was 75° to 82°F in the shade and the nights were very oppressive. Apart from William and Elizabeth Murray, the only other passenger with the name Murray on the Bengal Merchant when it sailed from Greenock was John A. Murray, whose stated age was 25. While that age would fit with that of William's older brother John, the journal written by John A Murray (see below) has no mention of any relationship; also there is other information in the journal that indicates it was unlikely they were related. 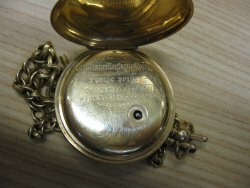 William Murray’s obituary stated that he was “tailor to the New Zealand Expedition Company”, but he is recorded as a labourer in the indents. He may have travelled as a labourer to take advantage of a free passage. Similarly, wives of labourers had free passage. After a voyage of 113 days, the Bengal Merchant arrived in Port Nicholson New Zealand on 20 February 1840, a month after the first migrants had arrived there. They dropped anchor off Petone Beach. As per the terms of the charter, they lived on the Bengal Merchant for three weeks, going ashore every day to build their dwellings. For those first few weeks, the weather was wet and stormy. The first settlement, Britannia, was near a Maori village called Pito-one (now Petone, a suburb of Lower Hutt). Later, the settlement was moved across the harbour to the location of what is now Wellington. For the first three or four weeks all parties were busy erecting dwellings on the beach near the river Hutt. The houses are built of spars cut from the forest and roofed with long flax-grass and a kind of flexible cane called supplejack. We are in Clyde Terrace, and the dwellings are the best in the Colony. The minister lives opposite where I live. Mr. Macfarlane has divine service on the beach every Sabbath; also a Mr. Butler, of the Church of England. The Maoris pronounce my name O'Mare, which signifies ‘a bad cold'. 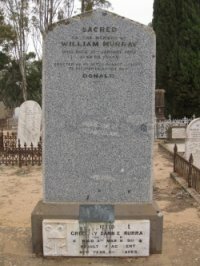 William and Elizabeth Murray’s first child, Donald Murray was born on 5 August 1840, just over 9 months after leaving Scotland and 5½ months after arriving at Port Nicholson. There is a family story that Donald was the first white child born “on that island and the fifth in the whole of New Zealand”. 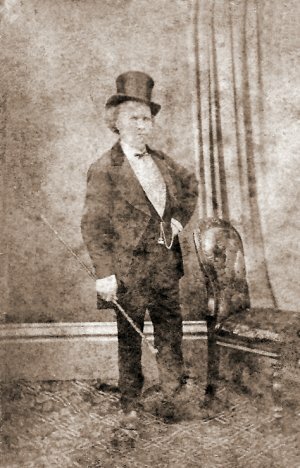 However, the first white child born in the North Island was Thomas Holloway King, born in 21 February 1815, at Rangihoua in the Bay of Islands. Three people were claimed to be the first European child born at Port Nicholson: Thomas Rogers, W. Dorren and L. Holmes (all born 1840, when there were 22 births at Port Nicholson). Donald Murray may have been the fifth white child born in Port Nicholson. 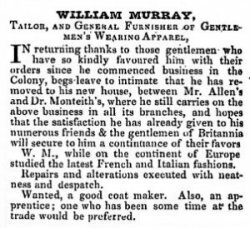 By November 1840, 22-year-old William Murray (who was advertising that he had studied fashions while on the continent of Europe) was already well established as a tailor in Port Nicholson, was moving to new premises, and was advertising for a coat maker and an apprentice. 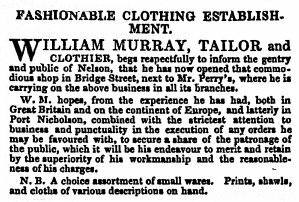 But, in December 1841, less than two years after arriving, Mr W. Murray, Tailor, was selling his house and shop in Port Nicholson. By 1841 the New Zealand Company was looking for a larger area to form a new settlement and Maori Chief, Te Rauparaha, agreed to a settlement in the Nelson area in the South Island. On 1 November 1841 the Arrow, with surveyors on board, sailed into the Nelson Harbour and chose Whakatu as the site for the settlement. It was named Nelson after Admiral Lord Nelson and a number of street names are associated with his naval campaigns in the Napoleonic wars. Captain Arthur Wakefield chose the summit of Church Hill (Pikimai) to erect the pole which marked the base of his survey and laid off from it Trafalgar and Nile Streets to be the two main thoroughfares. On 16 December 1841, the Murrays sailed to Nelson on the Look-in (New Zealand Gazette and Wellington Spectator, 18 December 1841). On 1 February 1842, the settlement of Nelson was officially founded with the arrival of the first settlers on the Fifeshire. 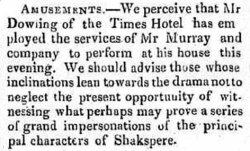 It was later reported (The Nelson Examiner, 9 April 1842) that William Murray had moved to Nelson “with the intention of opening a public house”. However, by April 1842, Murray had been unable to obtain a liquor licence, despite his best efforts; in fact “no licenses had been granted to the district, and no means of obtaining them had been pointed out by the Government”. So he opened the Caledonian Inn for business anyway. He was charged with selling liquor without a licence (despite several others doing the same). On the night in question, Murray admitted he had sold liquor. Evidence was given there was a fiddler and people danced; one man struck another in the face; that these men were immediately turned out and prevented from fighting; that Mr Murray endeavoured to the utmost to keep order, and that he succeeded in stopping indications of unruliness in some of his customers; and that liquor was refused to be served by him after 10 o'clock at latest. Further evidence was given of other evenings when he had admitted into his house certain disorderly and riotous persons, whom he was unable to restrain from somewhat riotous proceedings. Uproar had apparently taken place at Murray's on the previous Sunday night. He was fined £30, an excessive amount at that time. There was public outrage. It was considered that Murray had been charged and fined excessively as a way of punishing him for keeping a disorderly house, despite his best efforts to maintain order. It was also pointed out that he had been fined for an offence for which he had not been charged. The case was taken up in Public Meetings and reported in newspapers, with widespread support for both Murray and the principles involved – “inflicting a fine for the commission of one offence because the law does not enable you to punish for a supposed offence of a different character”. There was also outrage that Murray had not been able to obtain a licence and if his public house was not open “the public would be placed in the predicament of having no house for refreshment or entertainment”. “True, he is a Scotchman, and keeps a grog shop; but there are other Scotchmen who keep grog shops. William Murray is not damned because many publicans are sinners, any more than a magistrate is saved because there are Pharisees in Heaven”. The resolutions of the Public Meeting were to “be advertised in the Nelson Examiner, and that placards containing copies thereof be posted throughout the town without delay”. The money for Murray’s £30 fine was raised by public subscription. At no stage was Murray’s young age – presumably 22 years old – raised as a relevant issue. Extracts relating to Murray's case from the Nelson Examiner and New Zealand Chronicle, April 1842. 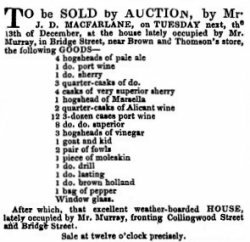 By late 1842, Murray had his house and stock for sale (Nelson Examiner and New Zealand Chronicle, 19 November 1842 and 10 December 1842) and was apparently getting ready to return to his preferred business activities, which involved alcohol and entertainment. In April 1843, he was finally granted a licence for the Caledonian Inn. Murray was in the second group of licences to be issued. The first eight licences had finally been issued in April the previous year, as a result of the outrage following his arrest and fine. Around this time (c1842), William and Elizabeth Murray’s second child was born: Catherine (Kate) Murray. It has been said in the family that she was the first white child born in Poverty Bay, which is on the North Island near Napier and was a remote whaling station at that time. It is more likely she was born in the Nelson area where the Murrays were living, but no record has yet been found of her birth. It is possible she was the first white child born in the Nelson area. In July 1843, William Murray’s name was on a long list of people signing several petitions in Nelson re “an erroneous statement calculated to convey an impression unfavourable to the memory of our lamented fellow colonists who fell in the late massacre at the Wairoo”. The Wairau Affray (17 June 1843) was the first serious clash of arms between the Maori and the British settlers after the signing of the Treaty of Waitangi, and the only one to take place in the South Island. It was the culmination of the NZ Land Company’s illegal acquisition of land from the Maori. When negotiations broke down, a Chief destroyed the survey pegs and thatched huts on his land, which led to Magistrate Thompson (Murray’s nemesis) issuing a warrant for the Chief's arrest. An armed party was sent to arrest the Chief, but apparently its leader, Thompson, behaved aggressively. Fighting broke out after the settlers fired the first shot, which killed a Chief’s wife. Four Maori died and 22 British settlers, of whom some were killed after surrendering to the Maori, as revenge for the shooting of the Chief’s wife. The dead included Thompson and Captain Wakefield of the NZ Land Company. The incident heightened fears of an armed Maori insurrection among settlers. Church Hill in Nelson was fortified and for some months the settlers retired there with their families at night. The news of what had happened and uncertainty about how far the fighting might spread meant that further immigration was suspended. With no new settlers bringing capital to Nelson the settlement developed only slowly; those who stayed suffered from food shortages. Conditions did not begin to improve until later in the 1840s; by then the Murrays had left. 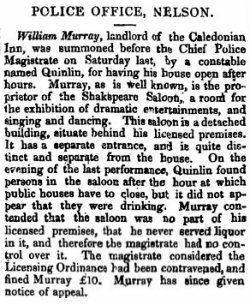 In April 1844, William Murray was the proprietor of the Shakespeare Saloon, a room for “dramatic entertainments, singing and dancing”, situated in a separate building behind the Caledonian Inn, his licensed premises. Constable Quinlin found persons in the saloon after a performance, even though it did not appear that they were drinking. Murray was charged with contravening the Licensing Ordinance. Murray contended that the saloon was not part of his licensed premises and he never served liquor there. He was fined £10 and gave notice of appeal. Extract from: Allan, R. (1965). Nelson: A history of early settlement Wellington, N.Z.:A.H. and A.W. Reed, pp.144-146 which describes the history of the licensed premises in early Nelson, William Murray's Shakespeare Saloon, and its contribution to the debut of theatre in Nelson. On 26 May 1845, William Murray sailed from Nelson to Sydney on the ‘Star of China’, arriving there on 18 June 1845. It is thought that Elizabeth and the children had preceded him. William's obituary states only that he went to Sydney and to Melbourne. A stillborn child was born in Sydney on 28 September 1845, but no other record has been found until the birth of the twins Christina and Barbara in Melbourne in 1849. 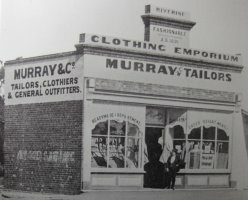 At that time, Murray's occupation is recorded as a tailor in Little Collins Street, Melbourne. Donald Edgar Murray was born 5 August 1840 in Port Nicholson, New Zealand; he died 7 July 1929 in Lidcombe, NSW, Australia. He married Mary Ann Spear (1854-1945) in 1875 in Hay, NSW. They had 9 children. Catherine Murray (aka Kate) was born about July 1844 in Nelson, New Zealand. On 18 July 1867 in Ballarat, VIC, she married Johan Santen, born c.1838 in Weener, Hanover, Germany, an upholsterer. They had one child, Hermann Santen, born 24 July 1869 in Ballarat, who died aged 4 months. They went to live in Germany and no further information has been found. Baby Murray (stillbirth) was born and died on 28 Sep 1845 in Sydney, NSW, Australia. Barbara Murray, twin to Christina, was born 10 July 1849 in Melbourne, VIC, Australia, and baptised 30 September 1849 at St Peter's, Melbourne; she died 26 March 1928 in Cootamundra, NSW, Australia. She married (1) Warwick Calmady Coates (1847- 1878) on 3 March 1870 in Talbot, VIC; they had 4 children. She married (2) Warwick's brother John Lamb Coates (1840-1929) on 14 September 1880 in Hay, NSW. They had 3 children. Christina Murray, twin to Barbara, was born 10 July 1849 in Melbourne, VIC, Australia, and baptised 30 September 1849 at St Peter's, Melbourne; she died age 4 months in about November 1849. John Robert Murray, aka William - no birth record found, baptised 7 Jul 1851 [Presb 9272/1851, parents William (tailor) & Elizabeth]; listed as William on his younger sister's birth record as born about 1852; later performed highland dances as Willie Murray, on tour with his father. Elizabeth Murray was born 7 Oct 1854 in Melbourne, VIC, Australia; she died aged 7 days on 14 October 1854. Harry Murray - no birth record found, but possibly born about 1856; mother is described as having an infant child in 1859 in Beechworth; later performed as Harry Murray, on tour with his father (South Australian Weekly Chronicle 29 December 1866); may have been "the boy that sleeps in the air" who was referred to as Montague Murray's son, started performing in 1862, and was estimated by a reviewer to be 8 or 9 years old in 1865. Alluvial gold was discovered in 1852 at the present site of Beechworth, attracting thousands of diggers to the area. By 1857, the population in the Beechworth area had increased to almost 20,000, with 4000 residing in the township itself. Churches, banks, stores and hotels, as well as a hospital had been established. Many Chinese miners made their way to Australia during the gold rushes. Although they were largely quiet, peaceful and industrious, a considerable number of them had acquired what were seen as bad habits such as opium smoking and gambling. Anti-Chinese sentiment was widespread; a poll tax had been placed on Chinese arrivals in Victoria in 1855, but the Chinese avoided it by walking from Robe in South Australia until that state introduced a similar tax. In 1857, an estimated one thousand Chinese resided on Spring Creek immediately opposite the Beechworth township, where they were reported to be living in low canvas tents, crowded closely together. 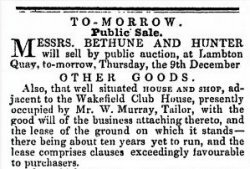 They were successfully working claims where it was formerly supposed that the ground had been thoroughly exhausted (Ovens and Murray Advertiser, 1 Jan 1857). This led to animosity and an Anti-Chinese League was formed in Beechworth in 1857, with a strong desire to have the Chinese expelled from the colony. It was estimated that one in four of the Chinese were addicted to opium, so the Victorian and NSW governments decided to impose a 10 shillings per pound import duty as a revenue raising measure. Opium was at that time legal and a common constituent of patent medicines, the most popular of which was the widely used laudanum, a mixture of opium and alcohol. 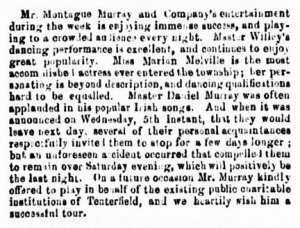 The Murray family first appear in the Beechworth area when "Mr W. M. Murray, Scottish Comedian, Comic Humorist, &c." placed a series of advertisements in the Ovens and Murray Advertiser, from 11 May 1857. He was organising a "Grand Bal Masque and Venetian Carnival" at the Crow Hotel, Silver Creek, in the Beechworth area. If the ladies of the goldfields were inconvenienced by not having anything suitable to wear, "Dresses to be had of Mr Murray at the Crow Hotel". A similar event was advertised for Wangaratta the following month. 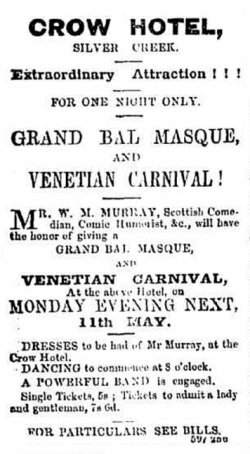 Over the following few months, Murray's Company performed drama, including Othello, a series of grand impersonations of the principal characters of Shakespeare, and other sundry entertainments at the Assembly Rooms and various hotels in the area. 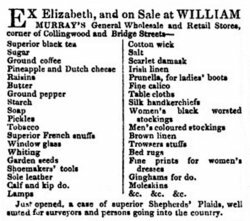 William Murray and his Company appear to have left the Beechworth area in late 1857, for the Maryborough goldfields area. His wife, Elizabeth Murray, stayed behind with her infant son. She was reportedly receiving some money from her husband, but was living in destitute circumstances in a tent in Spring Creek, the area largely populated by the Chinese. She was suffering from a cancer of the face and was probably in considerable pain, which she may have attempted to alleviate with the readily available opium. In January 1858 Elizabeth Murray was charged with lunacy and in July the following year her circumstances came to the attention of the Beechworth Council.
. . . From Messrs. Mellish and Larkworthy, respecting the destitute condition of Mrs. Murray of Spring Creek; stating that she was suffering from an incurable cancer in her face — that she had been in the Hospital on two occasions, and was not again admitable — that the woman had an infant child, and the case was one of heart-rendering misery, and one calling for the assistance of the Council. Mr. J. K. Brown said that were relief granted in this particular case, we should see persons in a destitute state from other parts of the district moving into the Municipality; and suggested that a Benevolent Society should be established in the town. That a good deal of destitution existed in the town. Mr. J. S. Clark said he did not consider that destitution existed to anything like that extent which Mr. Brown had stated it to be. He thought that £5 or £10 would meet the case, and that the Council were justified in devoting that amount for the purpose. The Chairman observed that the Council had some time since written to the Directors of the Benevolent Asylum in Melbourne offering to subscribe to the funds of that institution £100 per annum if they would receive such patients as were sent to them from this place, but only a qualified reply was received. He considered that it was now time to institute a Benevolent Asylum in this town, as the Government paid to such institutions £2 for every one pound. To stand over for a week. THE CASE OF MRS. MURRAY. The outcome of this case makes it clear that Elizabeth Murray did not want to be sent to hospital or to the Benevolent Asylum in Melbourne. She felt well supported by her neighbours (the Chinese community?) and wanted to continue in her current situation without interference. It is not known whether having her infant child (presumably Harry) in her care was part of this decision. 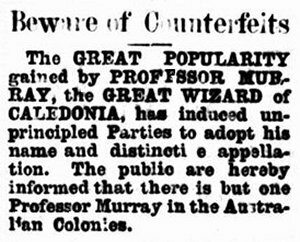 On 16 March 1861, there is a record in the Ovens and Murray Advertiser of William Murray living back in Beechworth, along with other members of his family, when David Kennedy was summoned for detaining Murray's goods. At some point before early 1862, William Murray and his company (including most or all of his children) left to go on tour again, leaving his wife, Elizabeth, behind. Murray appears to have made arrangements with the local clergyman for the lease and rates to continue to be paid on a small dwelling on Crown land on the far side of Spring Creek, on the outskirts of Beechworth. Elizabeth's occupation is listed as servant at the time of her death, so she may have been supporting herself by providing services to the local clergyman, or to others in Beechworth. On 23 June 1864 Elizabeth Murray was committed to Beechworth gaol as “a dangerous” (the Beechworth Lunatic Asylum, later known as Mayday Hills, had not opened at that time). She was bedridden all the time she was in the gaol, was apparently well cared for, and never left alone. She took food freely, but daily grew weaker. After several weeks, and a fortnight before her death, a warrant was obtained for her removal to Melbourne Lunatic Asylum. She was not removed because the medical officer certified she was unable to bear the journey. Elizabeth Murray née McEwan died on 1 August 1864 of “chronic disease of the brain, attended with partial paralysis, blindness and deafness”. She also had “old standing disease of the bones of the face”. She was age 43 and described as a servant; there are no details of her marriage or children on her death record. Because she died in the gaol there was an inquest, which gives reassuring details of the quality of care she was given there. For a period of about 13 years, from at least 1857, William Murray toured Australia with his troupe of entertainers. They travelled as far north as Rockhampton, and west across to Adelaide. Their journeys can be traced through a series of advertisements and reports in local newspapers. Most of their performances were in country towns and isolated settlements such as gold diggings. 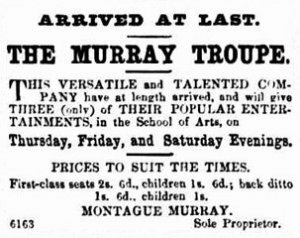 An advertisement for performers in 1860 is the earliest record that has been found of the Murray Troupe, and William Murray's use of the name Montague Murray. 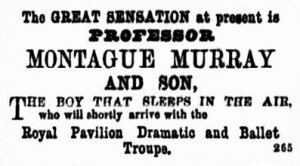 This appears to be his adopted stage and business name; later, after he had settled in Hay, he would call himself William Montague Murray. He most frequently performed as a comedian, or in comedy roles. 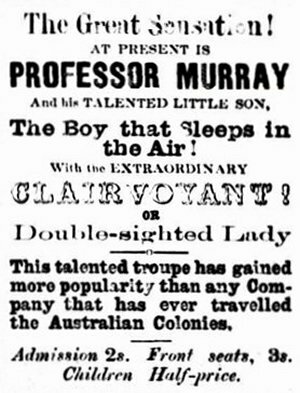 From 1862-1866 he also used the title "Professor Murray" and attracted a lot of attention for his "electro-biological" or mesmorism act "The Boy that Sleeps in the Air". This feat was performed with his "talented little son", presumably Harry. 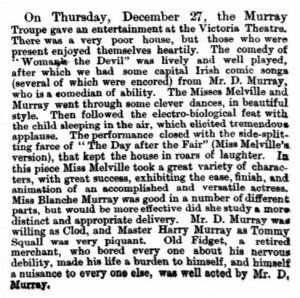 Murray's son Donald Murray performed with the troupe until at least 1867. He acted in drama and performed Irish songs and comedy. 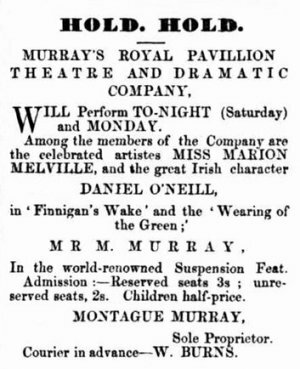 He sometimes used the name Daniel Murray, but more often he was Daniel O'Neil, the "Great Irish Comic Singer". 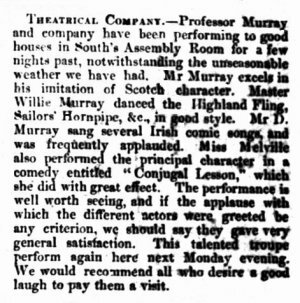 From 1863-1866, Murray's son William performed the Highland Fling as Master Willie Murray. 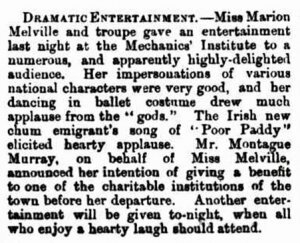 From 1863, Miss Marion Melville was the star of the show, and remained its principal attraction for the rest of the decade. She danced and performed dramatic roles to much acclaim. In the late 1860s she started taking dramatic roles with other companies, returning to the Murray troupe in between. 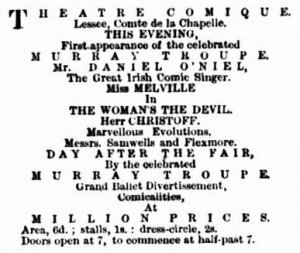 Even after the Murray troupe had folded, she did some solo performances with Montague Murray describing himself in advertisements as her "Stage Manager". She later went on to have a long career in theatre, performing until 1899. 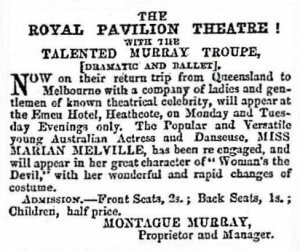 Murray's daughter Barbara Murray joined the troupe for a brief period in late 1866 and early 1867 on a tour of South Australian towns. She performed as Blanche Murray, acting and dancing. January 8th, 1864. Before J. Blair, Esq., P.M.; and T. Must, Esq., J.P. 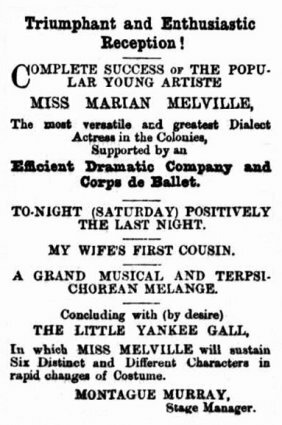 In early 1869, Marion Melville appears to have parted company with the Murray troupe and she became the star attraction for the Davies Great Vaudeville Company. Meanwhile, Montague Murray appears to have leased and become the licensee for the Sportsmans Arms on the corner of Pitt and Goulburn Streets in Sydney. This hotel had a hall, which over the years had been variously used for coaching boxing, the sport of ratting, and more recently as a Concert Hall. This latter use may have been the attraction for Murray. 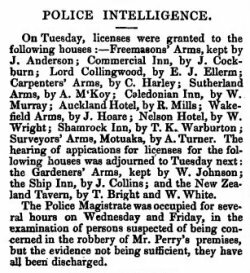 Then, in September 1869, the license for the Sportsman's Arms, Pitt Street, was transferred from Montagu Murray to John McMahon. 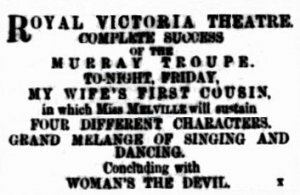 By November 1869, The Murray troupe including Marion Melville was back on the road again, first appearing in for Narrabri, NSW. But in January 1870, Murray appears to have had a dispute with a violinist in his employment, and in February Murray was confined in Darlinghurst Gaol on a charge of fraudulent insolvency. He had unsecured debts of £65.16s. and assets of £5. The cause of his insolvency was "heavy losses and pressure of creditors". He was was released on bail after a week in gaol and 3 days later the count of fraudulent insolvency was discharged as there was not sufficient evidence to send the case to jury. However, he was still insolvent and that matter dragged on for some years. A few days after the above charges by Thomas Dogherty against Murray were dismissed, Dogherty was in court defending charges brought by Murray. Apparently there had been an incident at Ben Lomand in January, when Dogherty attacked Murray. 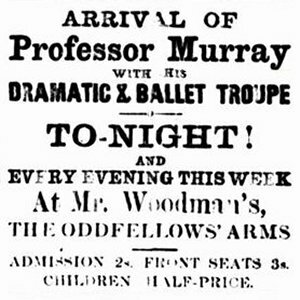 From July to September 1870, Murray made his last appearances on the entertainment circuit. He was still enmeshed in insolvency matters, but he took on the role of Stage Manager for "Miss Marian Melville's Company of Dramatists and Vocalists". 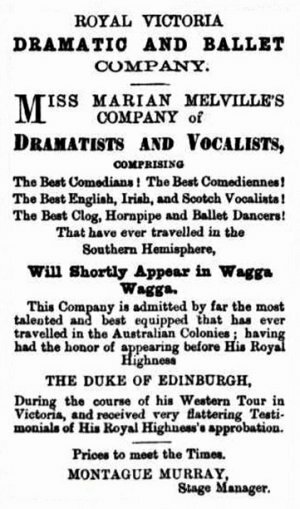 The advertisement below on the left refers to Miss Melville's Company having performed for the Duke of Edinburgh. Prince Albert, Queen Victoria's second son, was the first member of the royal family to visit Australia. He came in 1867 and stayed for nearly 5 months, travelling around and enjoying local entertainment. 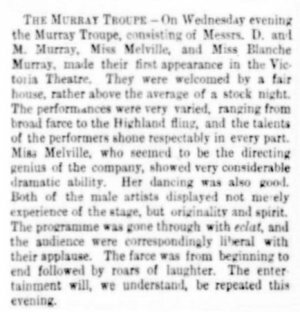 The Duke's "Western Tour in Victoria" must have coincided with the Murray Troupe's tour there in early 1868. 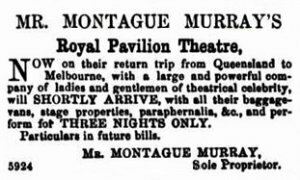 In September 1870, Montague Murray was charged with performing and causing to be acted a stage play, including stage dancing in the building in Murphy street, Wangaratta, known as the Argyle rooms, without the authority or licence of the Chief Secretary of Victoria. The defendant pleaded 'Guilty.' He stated that he had played 60 or 70 times in the Ovens district, and had never been interfered with. 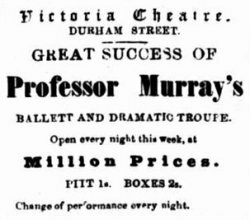 He had made every inquiry about a travelling theatrical licence in Victoria, and he had been told by several influential members of Parliament there was no such a thing as a travelling theatrical licence for Victoria. The case was dismissed. (The Argus, 7 September 1870). Another similar case was also dismissed on the same day. The police inspector admitted that he did not wish to press charges, but he wished the Bench to take the responsibility off his shoulders. That is the last record that has been found of Montague Murray in his role in the entertainment business. His insolvency proceedings dragged on in Sydney until 1874, with numerous meeting scheduled and adjourned. He does not appear to have attended any of them. In late 1870 or early 1871, William Montague Murray settled in the district of Hay NSW. The family story is that his entertainment troupe was passing through Hay during a drought. If they went on, they could not be sure of water and feed for the horses pulling the drays, so they stopped in Hay and then he stayed on. He supposedly took up a small holding of land, on the south side of the town (perhaps for his horses), but relinquished it after a short time. 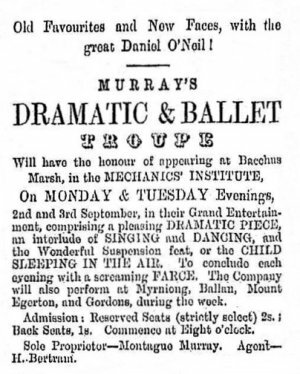 The evidence suggests that his own troupe had already disbanded around the time he became insolvent, but perhaps it was Marian Melville's Company that was stranded in Hay by drought, as there is no further record of it. With his insolvency still hanging over his head, Murray may have been looking for somewhere to make a fresh start. Possibly his eldest son, Donald, was already settled in Hay. So William Montague Murray went back to tailoring, as Murray & Co with his son Donald, also a tailor. A few years later, in c.1876, his daughter Barbara, her husband and children, also moved to the Hay district from the Victoria goldfields. Others from her extended family were to follow later. It is not true that we have been appointed Tailors, Clothiers, and Outfitters to the Mayor and Aldermen of Hay. But we would recommend each of them to order one of our Suits to measure, and guaranteed shrunk, at £4 1Os. net cash, so that they may have a GENTLEMANLY APPEARANCE When they enter the Council Chamber". Letter published in The Hay Standard on 13 November 1872 from a correspondent at Oxley, complaining that Murray & Co. of Hay has literally swarmed the country with placards informing the public that they supply a gentlemanly appearance for the moderate charge of £3/10/-. The writer doesn’t object to the ads but it certainly is not pleasant to have 10 or 15 minutes’ work and perhaps a little profanity to get a timid horse up to a gate because Murray & Co. are stuck up on each gate post. In 1874 Murray built a shop which is now one of the oldest commercial premises in Hay – the location is known by all as Murray’s Corner. In his later years, William Montague Murray became active in public life and had strong views, expressed in a colourful manner: “. . . for both at public meetings and in private, he spoke out with an eagerness, fluency and wit, that compelled attention whether his audience believed him right or wrong” (obituary in The Riverine Grazier, 24 January 1880). In November 1871, a meeting was held regarding making Hay a municipality. Of 700 inhabitants, 100 attended the meeting. Murray was one of only two people who spoke out against the proposal. A petition was prepared by the residents and a committee was elected to work towards forming the township of Hay and the suburbs thereof into a municipality. Elections for aldermen were held in August 1872. At the first municipal meeting the local businessman, Frank Johns, was elected mayor.
. . . Mr Murray, (tailor and clothier) and Mr Sorensen then addressed the meeting at some length against the proposed municipality, contending - that it was too early for such an institution - that corporations did more harm than good - that they were made for friends of prominent public men - that the frustration was not wanted, as government could do all that was required - that Deniliquin Corporation had worked badly - that they had there spent their money on goats - that the corporation had impounded goats belonging to poor people - that municipalities did not benefit the working classes, &c., &c., all of which were answered by several speakers.
. . . As to the objections to Mr Phelps, what did they want of him – he had worked if he did not speak. Did the people of Hay want £500 a piece! (Mr Murray – “Mr Twynam wants to be town clerk.”) He moved that Mr Phelps was a fit and proper person to represent this constituency in Parliament. Mr Murray, the tailor at Hay, said he was a close observer of what was going on, but he had never seen Mr Phelps's name in the ayes and noes; he had never heard of him saying a word in the House. However, he might for all that be a very estimable gentleman. The great want of this district: is a railway from Echuca, but Sir James Martin would rather make a railway from Dubbo to Bourke where you might go fifty miles and not meet a dozen persons than he would have one made from Echuca here, where it was so much wanted. The reason for this is well known – Sir James Martin has a deadly hatred of Victoria – he knew this very well, for he had known Jimmy Martin ever since he was a clerk running with a blue bag for Bob Nicols. We would never get justice from Sydney, therefore a part of this territory should be cut off, and added to Victoria. On Thursday 15 August 1872, a meeting was held at Carter’s Crown Hotel to give all the candidates for the Municipal election an opportunity to address the electors. W.M. Murray spoke and his speech included much mud-slinging. On 11 December 1872, a meeting was held at Carter’s Hotel at which Mr Twynam was censured. Mr Murray likened Twynam to Frankenstein, as he had pushed for Hay to be a municipality, but when he couldn’t get his chosen people in, he’d turned against it, like Frankenstein against the monster he’d created. Censure passed. Letter published on 28 May 1873 from W.M. Murray complaining about a J. Mathewson, regarding the Presbyterian church. 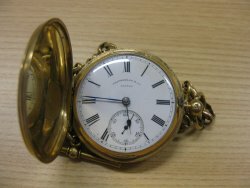 William Montague Murray’s gold fob watch, presented to him in 1877. He was not a candidate, but was active in his support of the local candidate from Hay, Colin William Simson, who was elected. On 4 November 1878, 58-year-old widower William Montague Murray married 40-year-old Naomi Edwards. Nearly three years after his death, Naomi married again, to John Mather of Stuart Mill, Victoria. She died in 1909 in St Arnaud, Victoria. On 21 January 1880, William Montague Murray died in Hay, age 60, after being bedridden for ten months with his first and only illness. His obituary (below) has some inaccuracies, but gives an overall picture of the life of this colourful man. Montague Murray. – There passed from us and from this mortal state, on Wednesday, 21st instant, at 7 p.m., Mr William Montague Murray. The announcement will be read with real sympathy by nearly every person in this district, and by numbers over all Australia and New Zealand - for Mr Murray's previous business of catering for public amusement, took him every place where men do congregate. His pleasant buoyant and impulsive ways will be missed, for both at public meetings, and in private, he spoke out with an eagerness, fluency and wit, that compelled attention whether his audience believed him right or wrong. Deceased, who was best known as Montague Murray, was a native of Glasgow, where he was educated at the Highland Society’s School, and served his apprenticeship to the tailoring trade, in which he has been very successful in Hay, and is succeeded by his son Donald Murray. Early in life he acquired a taste for theatricals, and we have listened with pleasure to his happy recital of humorous incidents connected with the band of amateurs of which he was a member. 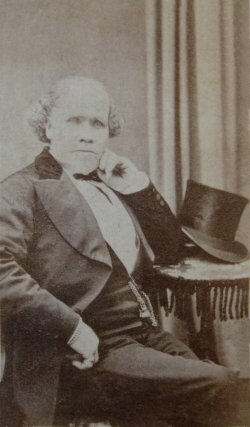 From Glasgow, he sailed with his wife to New Zealand as tailor to the New Zealand Expedition Company in the ship “Bengal Merchant” about 40 years ago, landing at Port Nicholson, where his eldest child Donald was born – the first white child born on that island, and the fifth in the whole of New Zealand [not so; but he was amongst the first born at Port Nicholson]. 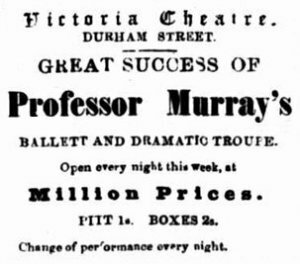 Mr Murray afterwards did a flourishing business in Dunedin [actually Nelson], as lessee of a theatre and hotelkeeper; afterwards he moved to Sydney and to Melbourne, from which places he made tours of the country with a company of theatricals in his pay - money sometimes flowing in upon him - at other times “dead broke”. Some 10 or 12 years ago the writer met him in Deniliquin on his way to Hay, where he gave up his professional rovings and settled down as a master tailor, in what has proved his last home on earth. His last illness - which was about the only one ever he had in his life, was very lingering – for 10 months he lay on his bed unable to turn himself, but he was tended by kind and loving friends, and his intense sufferings from pains in his legs and from bedsores – were mitigated and soothed as much as human age could do. Farewell – good, eccentric, impulsive, kind old man, may we meet again in a better, grander, happier world, where we shall laugh at former foibles, and enjoy eternal life without one drawback of sin or ignorance.